Home » Archive » Algemeen » ‘Having faith in the impossible’. How African-initiated Pentecostalism shapes Dutch cities. ‘Having faith in the impossible’. How African-initiated Pentecostalism shapes Dutch cities. Part of our research focuses on the African Diaspora, both in terms of the religious leaders and their views on health and sexuality, and in terms of the stories of individual migrants. People migrate from Sub Saharan African countries for all sorts of reasons; to study, find a paid job, escape dangerous situations, marry, be reunited with their family and a combination of those. But there is one reason that does not often receive attention from the mainstream media in Europe, and that is mission; bringing back Christianity to the cities of the Netherlands. Many Pentecostal churches from sub-Saharan countries are hugely ambitious when it comes to re-christianizing Europe, acutely aware of the process of secularization that has occurred in Western Europe and determined to counter it. So how do their ambitions shape Dutch cities? On the 21st of June, pastor and missionary Ibrahim Abarshi shared his story with the participants of the Urban Religion program of the festival “We make the City” in Pakhuys de Zwijger. A sociologist by training, Abarshi was making a career in the Central Bank of Nigeria, while ministering in the churches of the Redeemed Christian Church of God. This church was initiated in Nigeria in 1952, rapidly grew over the 1980s and 1990s and today parishes can be found all over the world. Its mission statement is focused on church-planting, in preparation for the end of times, to ensure that as many people as possible can go to heaven. To achieve this, the ambition is to ‘establish a church in a distance of 5 minutes walking or driving in every nation of the world’. A very ambitious mission statement. And indeed, research by our team and many other scholars indicate that this particular Nigerian church can be found across the globe, and has a strong presence in the UK, but also in the Netherlands and other European countries. What is happening to the city when it comes to religion and what does the future look like? 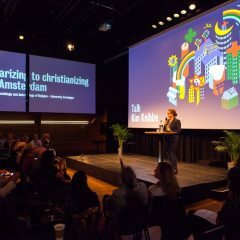 This was the question asked by the “We make the city” organizers, indicating that the assumption that religion is gradually disappearing from the city does not hold when looking at religious life and practice in cities like Amsterdam. Abarshi’s story reflects this: “I was called to Amsterdam, because God Loves Cities!” The mission to Amsterdam was not easy; dedicated to reach the native Dutch people, Abarshi invested time to engage with Dutch society. Initially flying back and forth from Nigeria, and later from a church and office building in Amsterdam Zuid Oost. He was warned that after decades of secularization, it would be hard to get native Dutch people to visit a church. “For reaching the Dutch, one has to have faith in the impossible”, as Abarshi stated. 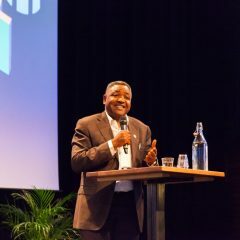 In a presentation preceding that of pastor Abarshi, Kim Knibbe showed how, within the imagination of many Pentecostal missionaries, Amsterdam features on the global map as an icon of free love and liberal values. On the map of the RCCG, Amsterdam is also a ‘missionary outpost’. When Abarshi’s church started to grow, it did so because it attracted many migrants, often in precarious positions. The church provided a sense of belonging to people that had to integrate in Dutch society. Assessing the needs of the congregation, the church started to organize Dutch courses, practical trainings to increase chances on the labour market, and assisted people in navigating life as a migrant in addition to Sunday services and Bible studies. The church was a safe haven for people in precarious circumstances, church members welcomed people in their houses in cases they were homeless and allowed them the possibility to become stable. The church grew because people knew they would be supported in the church. “We did not only focus on the spiritual, we ministered to the total human, physical and spiritual. We wanted the church to be a platform of hope”. The fact that the RCCG was able to buy their own building, providing spaces for these initiatives, was of crucial importance to develop them. This is one example of a Pentecostal church in a Dutch city, and not necessarily typical of all of them. Some congregations consist mostly of students and expats, while others consist of a population in similarly precarious circumstances. Some are part of global Pentecostal churches such as the church of Abarshi, while others created through the initiative of groups of migrants in the cities of the Dutch Randstad. What they do have in common is the aim to focus on the total human being, addressing spiritual as well as physical and social needs. Church platforms and networks, such as HUB and the Council of International Churches in The Hague or the Pentecostal Council of Churches in Amsterdam actively invest in building knowledge and expertise on social and health related issues. Thus, cities do not only provide the spaces where people can live and practice their religions, through religious practice people also actively engage in the city and shape the city context. If you want to know more about how Pentecostal churches shape the Dutch city context, you can check a special issue on this topic published by the journal African Diaspora (paywall). If you cannot access these articles, e-mail to K.E. Knibbe@rug.nl for a private copy.